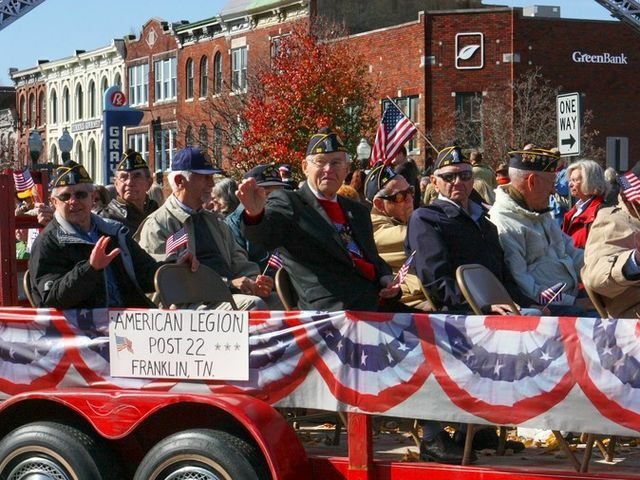 The City of Franklin will remember and honor all veterans at its Veterans’ Day Parade being held in Downtown Franklin on November 12th at 11 a.m. The parade is a joint effort of the City and local radio station WAKM AM-950. The parade route travels down Main Street, from Five Points to Second Avenue. JROTC units and/or marching bands from Williamson County high schools will participate. The Franklin Special School District will also send a large group of students to show their appreciation to veterans. The Parade begins promptly at 11:00 a.m. at West Main and Fifth Avenue. Prior to the parade, a reception will be held at the Williamson County Archives from 9 a.m. until 11 a.m. for local veterans and their families.